We have so little Faith in the Lord. We all live in a little box that our life exists in, and we don’t think about anything outside our box. We have such a small view of what is going on. Coach talks about fear and Truth. 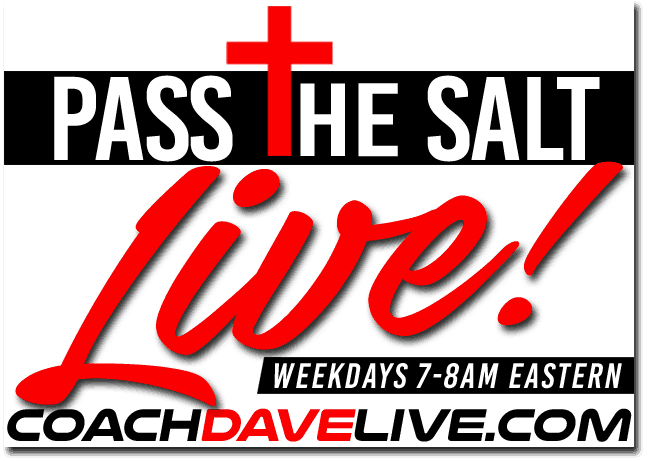 The whole purpose of Pass the Salt Live is to help people broaden their perspective. We are seeking truth. Knowledge of truth sets you free. The criminal justice system in America is patterned after Hell. The criminal justice system is all about tyranny. In our system, you are guilty until proven innocent. Once the government gets control of something, the name becomes the opposite. Justice Department? Department of Education? Homeland Security? Patriot Act? The leaven of the Pharisees is legalism. Pietism. This relates to how people aren’t going to vote for Trump, because they are more righteous than Trump. Voting for Donald Trump is not a sin. If you are pietistic, you do. Pietism is personal holiness. What is the difference between pragmatism and the greater good? We are all unrighteous, unless made righteous by Christ. The left is trying to get pietistic Christian not to vote for Trump. They are doing everything than can to play us like a flute. The leaven of the Pharisees is self-righteousness. Sometimes we forget grace. Hillary Clinton or Donald Trump. The most wicked abortion loving witch on earth, or someone who says he will protect life. Hillary Clinton will destroy our free speech rights. She will destroy everything good, clean, and pure in this American world of ours. Hillary is pro-death with no exceptions. Trump is pro life with some exceptions.